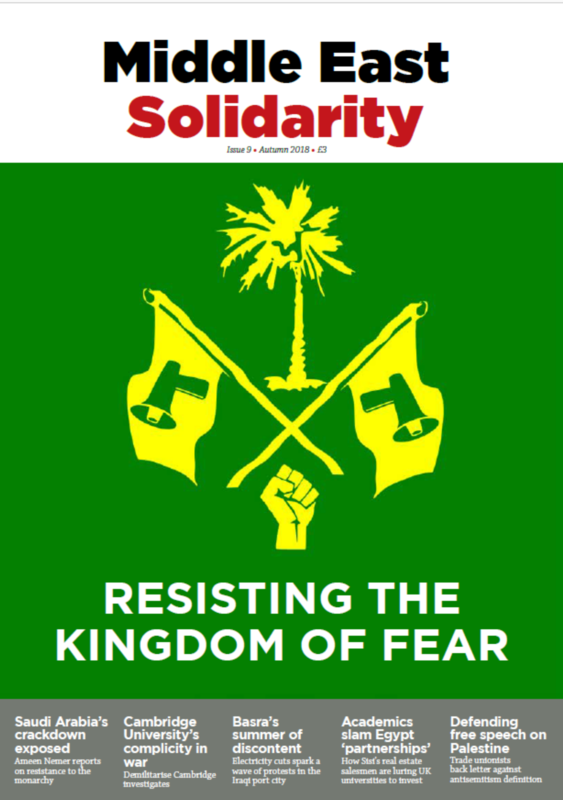 In the cover story for Middle East Solidarity issue 9, Ameen Nemer reports on resistance to Arabia’s brutal monarchy. In 2011, during the Arab Spring, Prince Talal bin Abd-al-Aziz predicted a dark future for Saudi Arabia after the death of his brother, King Abdullah. Across the Arab world, the courage to topple tyrants had become contagious. “The people want the downfall of the regime” became the slogan of the day. Faced with a rising wave of protest, Saudi Arabia’s rulers used every means they could to try and kill any movement within the Kingdom, even before it was born. Externally, Saudi Arabia was the leader of the counter-revolution. It sent troops to crush the popular uprising in Bahrain in March 2011. It supported the military coup against a democratically-elected government in Egypt in 2013. Meanwhile, this absolute monarchy claimed to support democracy in Syria by sending weapons there to topple the Assad regime. In all of these cases, the goal was to preserve the status quo in Saudi Arabia, by intervening in the wider region. In January 2015, King Abdullah died and the crown prince became King Salman. The new king continued much of King Abdullah’s domestic and foreign policies, however he also launched a war against Yemen, codenamed “Decisive Storm”. The king’s admirers liked to refer to him as the “Decisive King”, making a war criminal look like a hero. King Abdullah had been known as “King of Humanity” despite his authorisation of hundreds of beheadings. The bloody war on Yemen was a small piece of a bigger picture of a new era of ruthlessness in Saudi Arabia. The war created opportunities for King Salman and his son, Mohammed bin Salman (MBS) to crush both potential rivals among their relatives and stamp out political dissent in a reign of fear. At the same time, thousands of innocent Yemenis have been killed on the decisive King’s orders. The Saudi-led air coalition targeted schools, hospitals, factories, universities, markets, funerals and even weddings during its first year. Among the many victims of repression since the war began was the prominent rights activist and Shi’a Islamic scholar Sheikh Nimr, who was executed in January 2016 along with other activists. Two months later, in April 2016, Mohamed Bin Salman’s Vision 2030 plan was announced. This was a PR firm’s white-wash of Saudi regime atrocities, which promoted a plan to transform the Kingdom socially and economically but not politically. Meanwhile, Mohamed bin Salman was fighting another battle, this time with his rivals inside the royal family. Mohamed bin Nayef (MBN), the former minister of the Interior was arrested in June 2017. Five months later, in November 2017, the regime carried out a wave of arrests against individuals accused of corruption, who were detained at the Ritz-Carlton Hotel in Riyadh. Those arrested included the Minister of the National Guards, the billionaire Prince Waleed bin Talal and Waleed bin Ibrahim, the owner of the giant Middle East Broadcasting Centre (MBC). Many of them were released later after giving up some of their assets. This assault on important figures within the ruling family has changed the balance of power, which before King Salman’s accession to the throne was divided between the Ministry of Interior, the Ministry of the National Guards and the Ministry of Defence. As Minister of defence, MBS successfully got rid of the powerful Minister of the Interior, Mohamed bin Nayef and the Minister of the National Guards, Mutaib bin Abdullah. MBS has marginalised his uncles and cousins to smooth his path to becoming the next King, the first grandson of Abd-al-Aziz, founder of Saudi Arabia in 1932. Yet for all his ruthlessness, MBS fears even his shadow. He has not been able to crush all opposition. Peaceful movements calling for political reforms have also been met with repression. The Islamic Awakening (al-Sahwa) movement in the early 1990s mobilised wide support with its calls for change. However, leading movement members were quickly imprisoned, including Sunni Islamic scholar Salman al-Ouda, who spent over a year in detention. In Sept 2017, Al-Ouda was arrested again as part of a campaign of arrests against critics of the regime. On the 4th of Sept 2018, the Saudi public prosecutor sought the death penalty for Al-Ouda on the basis of 37 charges against him, such as working for foreign parties against the Saudi regime and its interests. Seventeen members of Al-Ouda’s family are also banned from travelling. 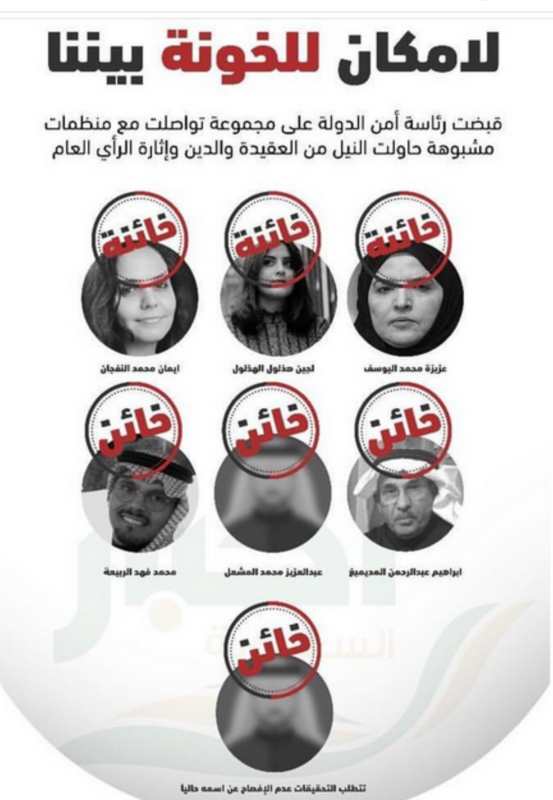 The Saudi Civil and Political Rights Association (ACPRA ) members faced the same fate as they were arrested. Mohammad Al Qahtani and Abdullah al-Hamid, co-founders of ACPRA, were sentenced to 10 years in prison in 2013 after an unfair trial in the politicised Special Criminal Court. Activists from the country’s Eastern Province have also been singled out for harsh treatment by the regime. Human rights activists Israa Al-Ghomgham and her husband Mosa Al-Hashim participated in demonstrations in Qatif on the Gulf coast during the Arab Spring in 2011. In December 2015 she was arrested with her husband from their home in Qatif after a raid. In late 2017, Al-Ghomgham’s family indicated a deterioration in her health. In August 2018, the Saudi regime’s prosecutor called for the death penalty for Al-Ghomgham on charges related to activities on social media and demonstrations during the Arab Spring. In solidarity, activists launched a Twitter account @IsraaAlGhomgham to publicise her case. Although the Saudi regime has executed peaceful demonstrators in the last two years, the call to execute a female political activist is unprecedented. Israa al-Ghomgham’s next court hearing will be on 28 October 2018. If the death sentence is confirmed, the case has to be ratified by the King before beheading. Al-Ghomgham’s case is a flashback to the case of women activists arrested in May 2018 who the government-backed Saudi press accused of treason, which means a death penalty. The House of Saud believes it has inherited the land and its people as properties. When angry protesters gathered recently outside the home of Prince Ahmed bin Abdulaziz in London, blaming the ruling family for repression and war from Bahrain to Yemen, and chanting “Down with the House of Saud”, the prince asked: “What does the Al Saud family have to do with your chants?” The answer is very simple: no other country on earth is named after its ruling family. The first step towards a democratic transition not only in Arabia, but across the whole region, will come when we can talk once again about Arabians, not Saudis. In May 2017, a military operation lasted 4 months in Al-Awamiyah town. The regime claimed to be fighting terrorists and that it was developing a historical neighbourhood in Al-Awamiyah, Mosawara. 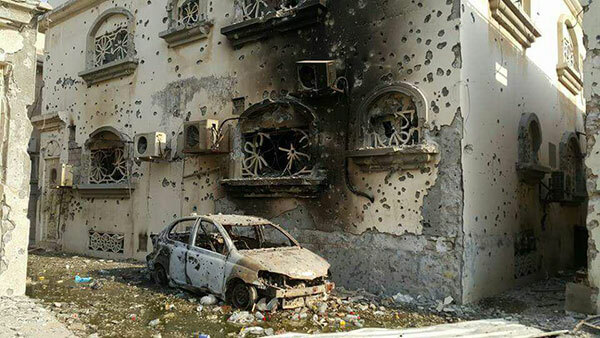 Despite the U.N calls to stop demolishing the historic buildings, the Saudi regime proceeded using heavy weapons killing dozens, injuring hundreds and displacing thousands. Al-Awamiyah was vocal against the regime during the Arab Spring in 2011. The town was known as the ‘capital of the revolution’ as protests involving thousands spread across the Qatif region. 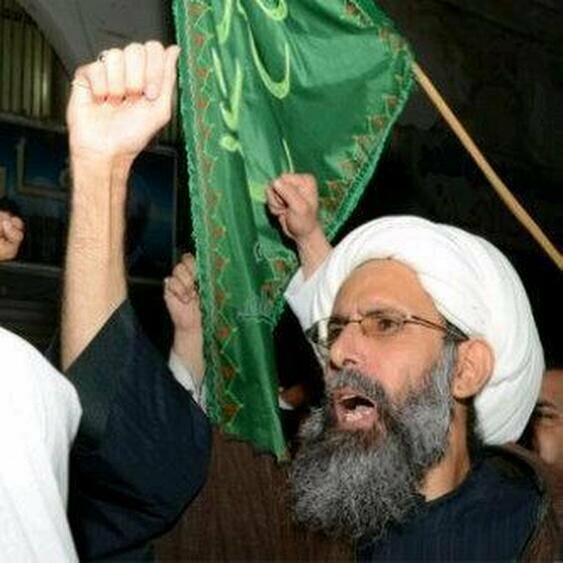 Sheikh Nimr emerged as a spiritual and political leader of the popular uprising, arguing for non-violent resistance to repression. “We will use words against bullets”, he said in a video at the time. Since that wave of demonstrations, the regime has set up security checkpoints cutting the town off from other parts of the country. Sheikh Nimr and other political activists were executed on trumped-up terrorism charges. Raids, arbitrary arrests, the killing of unarmed protestors and assassinations of men wanted on charges of taking part in the protests have all been used to silence Al-Awamiyah. The collective punishment of Al-Awamiyah aimed to send a message to other towns in Arabia of the dire consequences of challenging the regime.